If you find yourself congested and sneezing now that the blooms are finally opening, you are certainly not alone. According to the University of Rochester, 40-50 million people in the United States suffer from allergies. The Center for Disease Control cites 19.1 million of those cases to be Hay Fever, or an allergy to pollen. That means that as the flowers start to show their faces, millions of Americans have theirs buried in a tissue. These symptoms are often treated with antihistamines, NSAIDS, or steroidal nasal sprays; but allergy sufferers are often left feeling too drowsy, too wired, or raw in the sinuses. 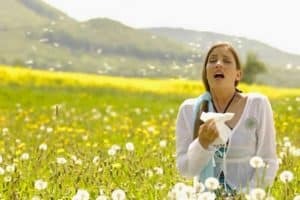 Often, people find that their seasonal allergies do not respond to these types of treatment and are left suffering through allergy season untreated. Acupuncture and Traditional Chinese Medicine have a (very) long history of treating and preventing seasonal allergies. While many over-the-counter solutions will help for a few hours, acupuncture has the ability to provide more extensive relief because it uses your body’s own resources to get to the root of the problem, not just mask the symptoms. Not only does it provide all natural symptom relief, but can keep your allergies from acting up in the first place. Patients who come to acupuncture seeking relief during an active flare-up of congestion, sneezing and coughing most often report that their symptoms were either relieved while they were on the table or that their symptoms cleared up later that day. The beauty of Chinese medicine, though, lies in the ability to prevent allergies from flaring in the first place. We have seen through clinical experience that people who come in for monthly maintenance or “wellness” acupuncture visits experience very few allergic symptoms when the buds open up and the pollen starts flying. For folks who love their Claritin, acupuncture works really well alongside over-the-counter medications and western allergy solutions. You can still use what has been working for you while we get to the root of the problem and keep the symptoms from returning.